Thank you for joining us for another Simply Sketched Saturday Challenge! We’re so excited to be sharing this hop with you. The products used are all available in the current Annual, or seasonal, Stampin’ Up!® Catalogues*. Simply use the buttons at the bottom of the post to keep hopping! So, what better place to start again than re-joining all of the talented ladies on the Simply Sketched Saturday Challenge Blog Hop. I made this card using the 'Circle of Spring' & 'And Many More' Stamp Sets from the Annual Catalogue along with Smokey Slate Cardstock & DSP. 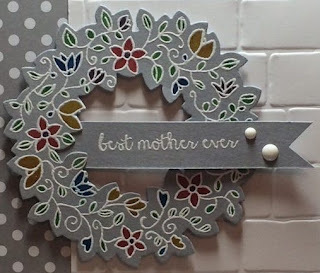 I also used the versatile 'Brick Wall' Embossing Folder. I water coloured the flowers using the Cucumber Crush, Garden Green, Pacific Point, Watermelon Wonder & Perfect Plum Ink Pads. 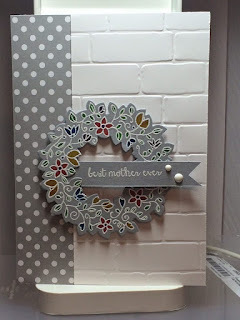 I heat embossed the wreath and verse using White Stampin' Emboss powder. Thanks for visiting....you can now hit the 'next blog' button and it will whisk you straight over to Keren's blog...Happy Hopping!